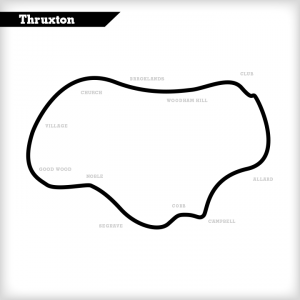 One of the longest and the fastest circuits in the UK at 2.356 miles, Thruxton is another old airbase which has been used for motorsport since 1950. 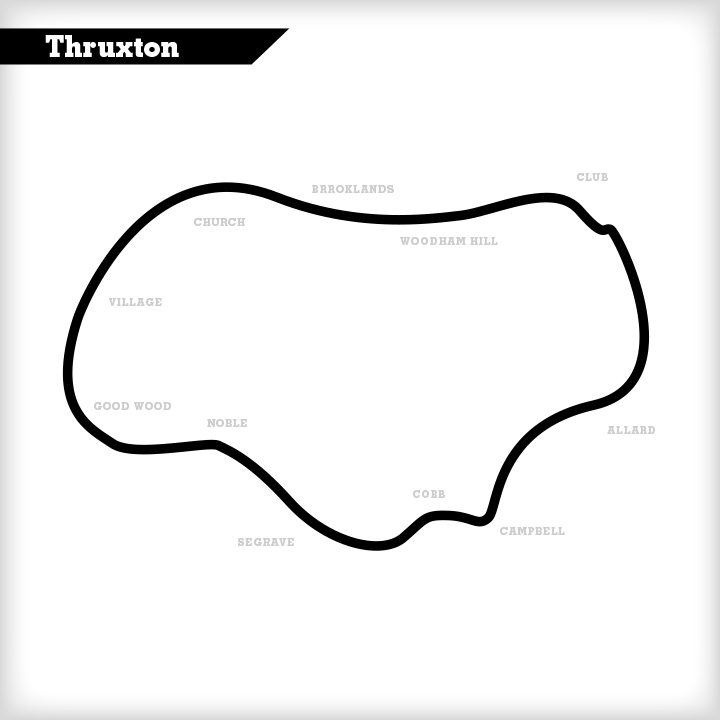 Racing at Thruxton is limited, and track days are even rarer due to strict noise restrictions so the visit of British Touring Cars and the British Superbike Championship are the main points of the season at Thruxton. The surface at Thruxton is a tough one and is known for causing severe tyre wear. Graining occurs but it does give surprisingly good grip in the wet. Like all airfields the winds can whip around and across the track giving the driver something else to fight against. Across the start line and you’re into the first long sweeping right hand corner that is Allard. Don’t let the car run too far left as you quickly have to bring it back towards the right to make as straight a line as possible for braking into Campbell. The entry to Campbell corner is the best example of a slow in, fast out type corner. It is important to slow the car down to get both a good apex and exit, as this will affect your speed through the second part of the chicane, and all the way through Cobb. Keep building speed all the way to Goodwood. Don’t let the car run wide out of Campbell, ensuring that you have a good approach to Cobb. Don’t scrub off too much speed before bringing the car to the left to have a good line in and out of Seagrave. A nasty bump just before the apex will unsettle the car, but from here on its all about small movements with the wheel. Gently bring the car to the right in preparation for Noble. Turn the car in just at the end of the right hand kerb and slowly wind the lock on. The inside kerb looks tantalisingly flat but it’s not so don’t use it! Be careful not to let the car run too wide or you will have a job to get it back to the left in time for one of the hardest corners which is Goodwood. This is a very bumpy corner with a very fast approaching stretch of grass on the exit. On the approach, aim your car straight towards the marshal post in front of you, gently wind the lock on and look through the corner. Have the confidence to let the car run all the way to the edge, but no more! Next is the famous Church. This is all about being smooth because the circuit drops away which doesn’t help and it’s very bumpy. Have the confidence to carry the speed in and use all the run off, but avoid the kerb on the exit as it has very big gaps which will slow you down. Some cars don’t mind a little kerb on the apex but try this cautiously! It’s a long run down to Club and by the time you reach it your car will most likely be travelling at the fastest speed it will have ever seen on a UK circuit. Position the car all the way to the left and make a straight line for braking, aiming towards the first part of the grandstand. Then slowly wind the steering on, easing the pressure on the brakes into the first part. Every car is different through this complex, as most take large amounts of kerb on the first and second kerbs, although others can hardly take any. Let the car run all the way out to the exit.